From short breaks with a couple of friends to larger groups, we are here to help every step of the way. 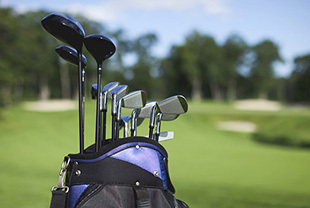 From hotels and Tee times to dining arrangements let us tailor-make a package to suit your needs. Below are some of the courses we regularly feature in our best-selling package offers, there are of course many more to choose from. Contact us if you have a specific course in mind and we will obtain a quotation for you! This entertaining links course has a great sporting atmosphere, to be played by golfers of all levels. 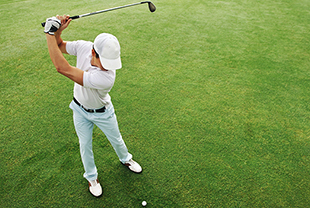 Difficulties arise from club selection, and players are often stuck between two clubs for their approach shots. The greens are often small and well defended, thus calling for extreme precision. Saint Cast is a short but very technical links. This course begins as a links then climbs to the point, offering you a splendid panorama of the Emeraude coast, before descending to finish along the edge of the beach. A challenging parkland course dotted with lakes and woodland. A wonderfully rewarding test of your game in a fantastic setting. The Golf des Ormes is one of the most popular for Channel Islanders, perfect for a golf break with family of friends, alone or with a group. 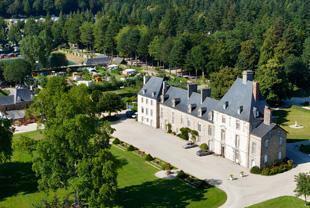 Accommodation available at Chateau des Ormes and the self catering complex. The Sables D'Or les Pins golf course, clinging to beautiful hilly countryside, will take you through 5585 metres of magnificent scenery with various water hazards. Tees, fairways and greens are automatically and completely watered ensuring quality grounds. 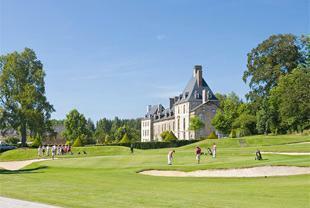 With its 13th Century Chateau, La Freslonniere is a charming, well equipped 18 hole course. The thoughtful player will be more successful than the big hitter here. You also have the possibilty of staying in the heart of this picturesque woodland in one of the gites or chambres d'hotes on offer. Beginners and experienced players will enjoy this superb 18 hole course overlooking the sea. Each hole has reasonably wide fairways for easier tee shots. However the greens are well defended by numerous strategic bunkers. A course with well protected greens and a mixture of tight and open fairways, together with a welcoming club house in the southwest of the city. Plenty of accommodation is available in Rennes. This course has wide fairways and is ideal for the longer hitters amongst us. It is a relatively flat course with a wide range of water hazards and bunkers. 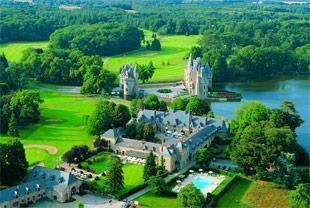 A wide range of accommodation is available in Rennes. This is the ideal location for a luxury golf break, set in 400 acres of magnificent scenery including forest and lake you find a challenging 18 hole course. 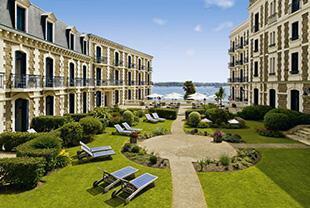 Accommodation is available in the luxury 4 star Domaine de la Bretesche Hotel. These three courses are held in great esteem by professional players on account of their excellent condition and their top quality facilities. They have been designed to combine intensive sport with beautiful surroundings. 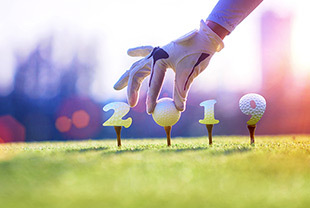 Discover all the subtle technical difficulties of these courses. Accommodation available on site. Ideally situated on Mount Canisy just a few minutes from Deauville, this course allows for magnificent views both out to sea and over the surrounding countryside. Deceptively easy, this course provides many a surprise. Wide fairways sound ideal but beware of the bunkers. 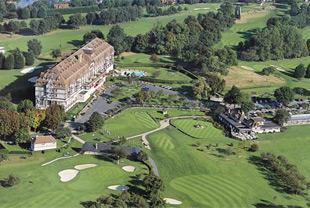 Accommodation available at Hotel du Golf Barriere de Deauville. Located 25km outside of St. Malo in Le Tronchet, Saint Malo Golf Resort is a haven of greenery and peace and offers great value stays to share between golfers. 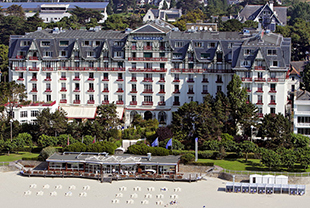 Le Grand Hotel Barriere is a fantastic five star hotel overlooking the bay of St. Malo, close to the beach and to the casino. 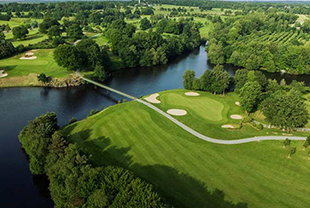 Hotel du Golf Barriere is a magnificent hotel, purpose built and renovated over the years to feature the latest in modern facilities and to reflect current design trends. 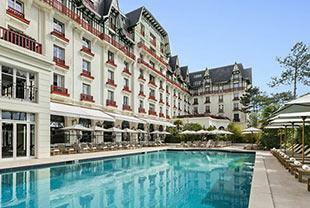 The building sits at the top of Mount Canisy, two kilometres from the centre of Deauville, with stunning views over the valley and out to sea. Golf pass for 3 courses!